"I'm honestly astonished we made it to 100 episodes just because when we started, we did like four or five of them and I didn't know what it was going to be. [But then] we did those two episodes where I realized that it could be something bigger." Yahoo’s “Old Baseball Cards” video series started back in 2016, when host Mike Oz opened a 1991 pack of baseball cards with Rajai Davis. 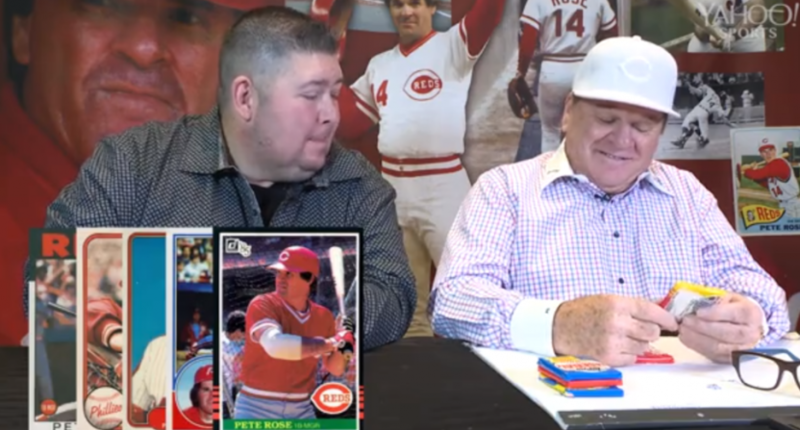 Three years later, the series has gained a fair bit of popularity and reached 100 episodes, with that 100th episode (a super-sized one featuring Oz opening five packs with Pete Rose) premiering Wednesday. Oz spoke to Awful Announcing this week and said he got the idea for the series thanks to some cards that were left from his grandma’s estate. Many people in my family love baseball, but I don’t know that I’d be where I am if not for her. I think about her every time we put out a new episode. My goal is to get @ChickenMan3010 on the show this year because he was her favorite player. Her cat was even named Boggs. My aunt and uncle asked me today if I wanted some more of grandma’s cards they found in the garage. Oz said Davis was one of the first players to show interest in the idea, but it’s become something that a lot of players have enjoyed. Oz has opened a lot of cards over the course of this show, but the one that stands out to him is the Canseco rookie card he was chasing back in the day. Oz said the 100th episode with Rose wound up being super-sized because Rose was so into the concept. Two episodes particularly stand out to Oz as proof that the concept had legs. The first one was the July 2016 one with Scott Boras, which dropped around the MLB trade deadline and featured a lot of trades, which Oz said then seemed like something to include in the series in general. Another one came when they featured Bobby Bonilla in an episode filmed at the 2016 All-Star Game. Oz said he never expected the show to last for 100 episodes, but he thinks it can keep going. The 100th episode of Old Baseball Cards is available on Yahoo here.